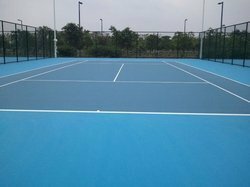 Our service range includes a wide range of badminton court flooring for outdoor and shuttle court flooring. 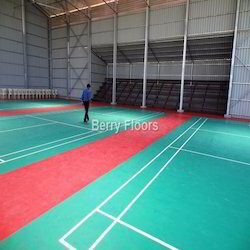 We have come up with very new outdoor badminton court flooring in 5mm thickness. Easy to lay. Advantages : No Knee & ankle pains. Easy maintenance. Protects from unwanted injuries. Suitable for all outdoor sports games like volley ball, basket ball and tennis courts. We are engaged in trading and supplying Shuttle Court Flooring. You will get all the above in our Limonta and REX Court sports flooring. It ensures safety and provides soft feeling to the foot and ensures maximum comfort ability for the players. We have professionally trained layman team for the installation. The shuttle court can also be used as Basket ball court.